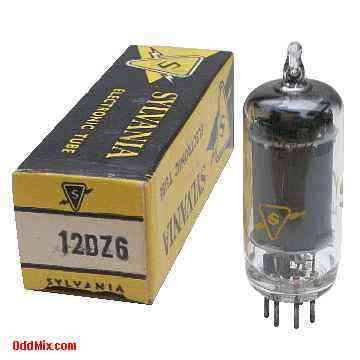 This is a genuine, vintage, Sylvania 12DZ6 Remote-Cutoff Pentode electronic tube. These miniature, lightweight, portable, compact, tubes were developed to work with the automobile 12 Volt battery as anode supply. Miniature type used as low B+ RF or IF amplifier in direct 12V battery powered receivers and many lightweight, compact, portable operated equipment. Useful part for antique car or other radio or television restoration. It is a NOS tube - New Old Stock, unused, boxed, excellent condition.